RUSH: Gonna get started on some audio sound bites. Let us start here with David Asman at Fox News. 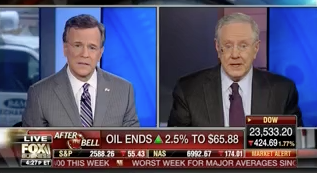 This was Friday afternoon on Fox Business Network’s After the Bell, and he’s talking with the Forbes magazine editor-in-chief, Teve Torbes. ASMAN: I listened to Rush Limbaugh today, and I heard [Trump’s] base speak, and they said he has become a part of the swamp. I mean, it was amazing to hear caller after caller after caller saying, “We’re not gonna be supporting this man anymore.” Do you think that lasts until November? TORBES: What it underscores is that it’s not so much the president’s problem because he doesn’t run until 2020. It’s a Republican problem because that’s where the voters will take it out on them: The base. But the key thing is we’ve got six months to the election, seven or eight months. But what you’re gonna see in the early fall is the president will veto the next spending bill; he will use it a campaign issue. BRAT: It went down in the same way it’s gone down for the last 10 years in a row. We did a budget. The Senate wouldn’t do a budget. The Democrats want increased spending on everything. So all that’s a given, right? Back in the budget, the Senate actually wrote in the budget that they will not do a budget for the year coming up in ’19. They don’t even want to do a budget ’cause they don’t have a tough vote. So today, that made news; Rush Limbaugh covered it. So President Trump can go to the Senate tomorrow and we can still get it right in this year’s budget. If you don’t do a budget, you don’t get to do reconciliation. That’s a big fancy word, but that’s how we were gonna get rid of Obamacare until the Senate tanked that one. BRAT: And they owe us. RUSH: Okay. So here’s what I didn’t put together on Friday. When I heard that Brat had said that the Senate has already said they’re not gonna do a budget, it didn’t mean that they’re just gonna stop. It means there’s gonna be another omnibus. It means there’s gonna be another continuing resolution. It means there’s gonna be another length of time that they can negotiate. This omnibus expires in six months, and the Democrats in the Senate have already said that when it expires, it’s not gonna be replaced with a budget. Which means it will have to be replaced with something else. And what we’ve been doing is continuing resolutions for a week, for two weeks, for three months. This one happens to be for six months. And it’s been called an omnibus ’cause everything got thrown into it. So this is gonna have to be renewed and it’s gonna happen right before the election and this is what Teve Torbes and others are saying that Trump will veto. He’s talked about the warning. He’s never gonna do this again. And if it comes up… He’s got his defense spending. He got what he wanted. He’s got the money in the defense budget that he can use if he wants. So now that he’s got what he needs to protect the country, he’s gonna veto it the next time this omnibus comes up. That’s what that was all about on Friday. RUSH: Got a great email during the break. “You brushed past this, Rush. Why won’t the Democrats do a budget? Why do they want continuing resolutions?” There are a lot of reasons why they don’t want to do a budget, but here’s the primary reason. 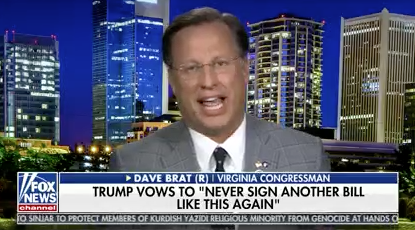 And Dave Brat mentioned it in the sound bite we played from his appearance on the Ingraham Angle on Friday night on Fox. Dave Brat said if you don’t do a budget, you don’t get to do reconciliation. Reconciliation, budget reconciliation exists to obviate the filibuster. A budget is required by law. I know, they’re not doing a budget. It’s required by law. Since it’s required by law, the filibuster rules are essentially not applicable. So in budget reconciliation, all you need is 51 votes. And that’s why the Democrats don’t want to do a budget. They want the filibuster to stay in play requiring 60 votes to shut off debate and then start the voting. Obamacare happened with budget reconciliation. Obamacare never had to get 60 votes. The Democrats had so many advantages that the Republicans, if they had all voted in unison, House and Senate, they could not have stopped Obama on anything he wanted to do. So the reason the Democrats will not agree to budget reconciliation’s is ’cause it takes the filibuster off the table. So we just get these continuing resolutions. Now, the next question, well, why do the Republicans let ’em get away with it. It’s not a matter of that. It’s needing 60 votes to stop this and move on to reconciliation. But the only piece of legislation required by law is the budget, which is why there is an exemption from the filibuster for budget, ’cause it has to be done. As a matter of law, the country has to have a budget. I know we don’t have budgets. We haven’t so technically in violation of law, but they come up with continuing resolutions, which is just a series of spending bills. This one was called omnibus ’cause it was six months long and everything was thrown into it. Everything that would be in a budget. But there were not the usual by required 12 appropriations bills and all that. And these are Senate rules. And the Supreme Court won’t have anything to say about it. The Senate can make its own rules. The Senate can’t tell the Supreme Court how to do anything and vice-versa. Separation of powers.